Fail safe feature allows pilot to always hear radios - even if the intercom is off. Operates up to 40 hours on one 9-volt battery (included). Includes DC power cable to offer seamless operation on either battery or 11-34 Volt DC aircraft power. Push to Talk Switch inputs for both pilot and copilot. Music input for CD player, cassette player or AM / FM receiver. Audio output for recording ATC flight dialog. The Transcom II is available in 2 place, 4 place, and 6 place versions with the addition of one or two remote expansion modules (accommodating two passengers each), which are connected to the main unit by a 4 foot cord. This allows the backseat passengers to have their own units and connection points, and helps keep cord entanglements to a minimum. A music input in all Transcom II intercoms makes long trips more enjoyable for crew and passengers. An audio output records flight dialog for post flight review, a great training tool for any pilot. Size: 4" x 2.9" x 2"
Pros: Operatate on 9v power source. Review: I have used this intercom for years and it is a reliable option for my plane that does not have an electrical system. A standard 9v battery runs the unit for several flights even in cold weather before it needs replacement. Review: This intercom is great.I use it in a Luscombe and have never had such clear communications. This also the first time that I need to turn my radio to about half volumn so it's not too loud. Worth every penny! 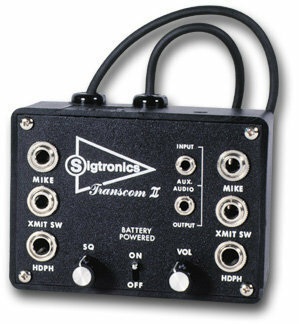 Review: The Sigtronics SPO-22 Two Place Intercom is very acceptable. Its easy to set up in the cockpit and small enough to not take up active space. When attached, you and your co-pilot or passenger can communicate when necessary with no problem. Q: Will it provide stereo music if I use a stereo headset? A: Yes, this is stereo cable. Q: Does the SPO-22 two place intercom come with an additional expansion modules for additional plug ins? If not, is it compatible to add additional expansion modules. A: The SPO-22 does not come with an expansion module (the 22 means 2 place). But, you can expand it to four places with an expansion module. Q: If I want to record the audio on my iphone, what type of cable do I need? A: You would want to get the Smartphone Digital Audio Adapter for Airplanes. Q: I could hook and ipod up to this intercom, right? A: Yes, it does have the aux music input that you could use to connect your iPod.